Each fulfils a particular role to help beings. Symbolically they represent the pure state of the eight consciousnesses. Although the eight bodhisattvas or ‘close sons of the Buddha’ all possess the same qualities and powers, each one displays perfection in a particular area or activity. 8) the personification of the Buddha’s aspirations (Tib. སྨོན་ལམ་གྱི་རང་གཟུགས་, Wyl. 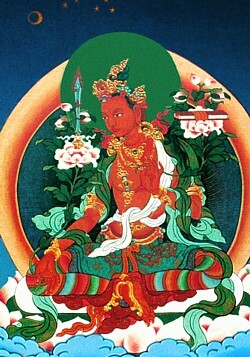 smon lam gyi rang gzugs) is manifest as Bodhisattva Samantabhadra. This page was last edited on 7 February 2019, at 03:48.